A road diet and buffered bike lane are finally coming to San Jose Avenue north of 280, a.k.a. the Bernal Cut, where neighbors have fought for traffic calming for years. 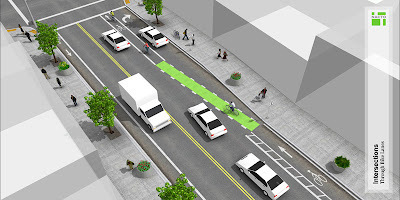 The SFMTA and Caltrans are moving forward with a two-phased pilot project — first, in March, the SFMTA will reallocate one of San Jose’s three northbound traffic lanes to widen the existing bike lane with a buffer zone, much like the southbound side. If traffic speeds don’t drop below the target, Caltrans will remove one of the two traffic lanes on the 280 off-ramp that the agency added in 1992 to accommodate re-routed traffic during freeway repairs after the Loma Prieta earthquake. 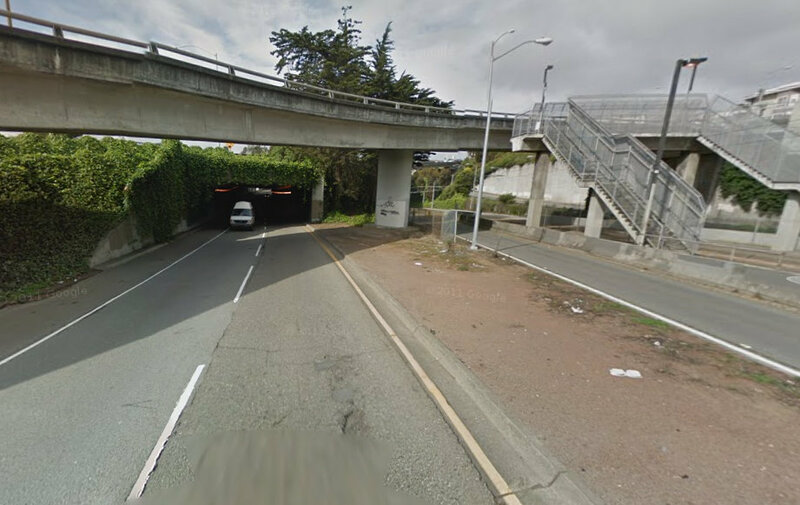 “There’s been a fight with Caltrans for 20 years now to get it back to one lane,” said Jon Winston of Friends of Monterey Boulevard, who has pushed for safer streets in the neighborhood. San Jose has a speed limit of 45 mph, and 15 percent of drivers travel faster than 48 mph (the so-called “85th percentile” speed, which traffic engineers use to assess motorist behavior and street design), according to the SFMTA. On the off-ramp itself, the 85th percentile speed is 57 mph. The agency aims to bring those numbers down to 35 mph. The SFMTA will measure speeds after the San Jose road diet from March to August and complete an analysis in October. If the speeds aren’t down to 35 mph, Caltrans will put the off-ramp road diet into effect soon after. The project appears to have no significant neighborhood opposition, as residents have long called for slower speeds on the deadly Bernal Cut, which was dug out as part of the partially-built freeway network in the mid-20th century. I’m confused by the fact that the “target speed” is 35 mph but there’s no mention of lowering the speed limit from the current 45 mph. Is that just not mentioned? Or are the powers that be actually not taking the most obvious possible step? I need to confirm, but I believe the SFMTA plans to lower the speed limit to 35 mph, but only after lowering actual speeds, due to speed trap laws. This has got to be the bike route that freaks me out the most. It allows me to avoid hilly Chenery, but it is just nerve-wracking. The existing southbound bike lane is definitely better. However, it is still one of the worst in the city. Cars still travel fast (they accelerate in this stretch), and a lot of debris collects in the bike lane. I would not feel comfortable with anything short of the Cargo Way design. But kudos to Scott Wiener and his team for following through on this. It was very easy for him not to do anything, yet he did. At the very least this brings the street to level Deadly Sloat. I live in Ingleside and ride this bike lane on my commute to and from work everyday. Until now I have never understood why the southbound was buffered, but the northbound was not. For a long time, there was a portable radar speedometer on the nb side of the road. I’d regularly watch it clock vehicles at the 55-60 mph as I rode by. I’m looking forward this improvement as it should eliminate one or all of these daily occurrences for me: 1. being buzzed by a vehicle at a high speed (less than 3ft) 2. being cut-off or almost-right hooked by vehicles trying to make one of the two right-hand turns at ridiculous speeds 3. dodging debris in the the bike lane and forced into fast moving traffic because there is no where else to go. I’ve substituted morning coffee in my diet for the adrenaline rush this part of my commute creates. The ideal situation would be to blow the whole thing up and rebuild the 280/San Jose/Monterey junction on a single level. Since that won’t happen soon, they could at least put a stoplight on San Jose to slow people down & reconnect the neighborhoods on either side. Quite a Catch-22 there…the speed limit can’t be lowered to 35 mph until motorists are driving 35 mph. On the other hand, I guess we should *want* the first phase to fail to get speeds down to the target level so that the second phase will actually be implemented. Same here! I also live in Ingleside so this is a vital north-south route for me. 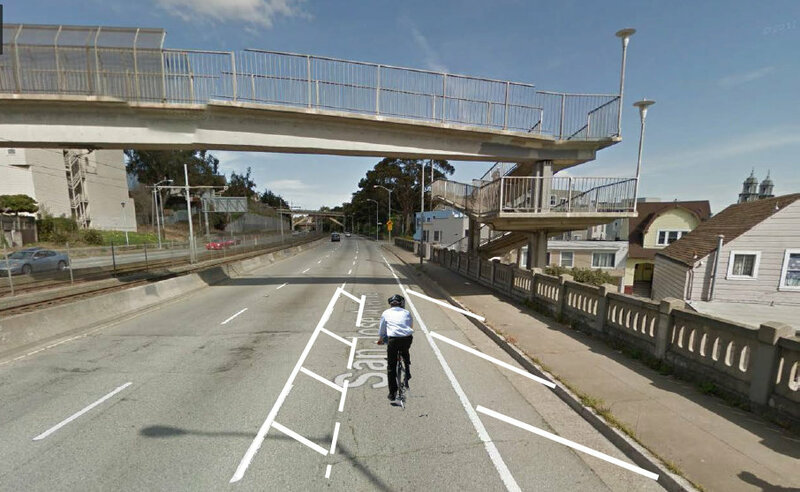 While biking northbound on San Jose half the time after St. Mary’s I just ride on the sidewalk as the current “bike” “lane” basically just feels like riding on a (poorly maintained) tiny little shoulder alongside a freeway. Any solution to this area needs to fix this insanity of the current bike paint markings moving to the left of right-turning traffic from San Jose -> Rousseau. This is an incredibly dangerous conflict point and I don’t understand how the city could allow such a thing to continue to exist. Either that or close off tiny residential Rousseau to San Jose car traffic. Practically every car that exits northbound SJ to Rousseau is only (ab)using that little residential street as a freeway offramp to speed through and get somewhere else. While I realize this is just a trial, I would really hope that final designs (and this should apply to the southbound side, as well) would include true physical separation via a cycletrack (maybe even a raised cycletrack in my wildest dreams?). By removing a vehicle lane there’s absolutely room for it. What’s funny/sad is after the Highland Ave. bridge the northbound San Jose sidewalk even gets full physical separation with concrete barriers for pedestrians, while bikes continue to get sacrificed to the cruelties of the freeway gods. This is progress, but … are they going to install jersey barriers to protect the cyclists? I don’t care what they post the speed limit as: unless cops are actually going to do some speed enforcement (though they might be too busy busting jaywalkers and cyclists rolling stop signs at empty intersections), cars are going to go 50 mph down this road and paint isn’t going to stop some careless motorists from barreling into (or really close to) a cyclist. Of course, the Jersey barriers are really not the best solution since they are ugly as hell, but unless they are truly going to fix this traffic sewer, they can at least give cyclists (and pedestrians) the protection they deserve. But if they really want to do it right, we shouldn’t need Jersey barriers. This sort of road design is completely anachronistic and I wish they would just turn it into a “regular” street instead of what is effectively a freeway. They could “activate” this street by creating a “green boardwalk” along both edges which includes both a cycletrack and a sidewalk with a bunch of trees and other greenery; it would almost be a mini-park/greenway. It could even be connected to the mini-greenway along Bosworth. They would also need to remove the concrete “fences” on the edge and get rid of the damn freeway signs. Get rid of the concrete surrounding the J-Church and make it like Church St with red-painted lines and lots of crosswalks. They need to reconnect the street with the surrounding neighborhoods and make it a place where pedestrians can cross normally without the ridiculous “hamster tunnel” (that dreaded design from the 1970s and 80s where pedestrians have to walk over the traffic sewer) like in the picture above. Coming off the freeway, they need to have traffic stop at a signal and make a normal 90-degree turn to get on the street; the current design (gradual banked curve which allows traffic to maintain its freeway speed) is out-dated and comes from a time when we thought it was a good idea (WTF?) to just slam freeways right through our cities. Of course, all this would mean SF would be prioritizing public transit, walking, and cycling over the private car, and unfortunately I guess it’s too much to ask the city to follow it’s own “transit first” policy. totally agree that this could be so much more! But i’d much rather see this implemented in the near term rather than wait years for planning, design, and construction! Lets keep it the long term goal, this and so many other SF streets! But with regards to government, it’s too easy to blame the City when it’s really a failure of the citizens. We need to put our money where our mouth is, and we need to drum up the support for changing our city from a car oriented city to a people oriented city! We need to find a way to make these changes happen better, faster, and cheaper! And we need to ensure that car lobbies, lawsuits, and onerous CEQA and public meeting requirements remain fair but cannot be used simply to delay and disrupt projects! We deserve safe, beautiful streets. This would be the perfect candidate for a boulevard! Agreed 1000%. As someone who got a $200 ticket recently for rolling through a stop sign on a bike on a *completely* deserted no-traffic residential intersection out near Lake Merced I’ve often wondered how the multiple po-po cars I regularly see speeding down San Jose ever justify not pulling over everyone driving for treating it like a freeway. Yet…never happens. Funny. (Before-and-After video of a thoroughfare which lost a car traffic lane and conventional bike lane and gained a separated cycletrack). I mean this so-called “buffered” stuff is still being proposed for a crazy-busy street in 2014?! With all that we know about actually successful bike infrastructure and complete streets the best that can be done is “buffer” paint? If there’s *anywhere* that deserves a physically separated cycletrack (and not just protected by paint or those flimsy plastic bollards) and certainly the other changes you propose it’s this stretch. We need people to experience how amazing and absolutely necessary this type of infrastructure is so they know what they’re missing by currently *not* having it. I agree that the citizens are part of the problem. However, I think we need both top-down leadership and bottom-up advocacy; their both equally necessary. The government (MTA), being the experts, needs to show better leadership and educate the people on why livable streets are a huge benefit to all. They shouldn’t be pandering to the uneducated public of whom the majority are emotionally-invested in their car-centric world with an inability to understand the broader environmental, health, and safety implications of car-centric urban design. But you’re right in that, if the people truly didn’t want this sort of traffic sewer design, there would be so much protesting that the city would have to listen. But again, I think it’s only because most people don’t have the ability to think open-minded enough about the issue to realize that they will actually benefit from all these livable street improvements. There is a 3-level interchange connecting an 8-lane freeway with a 6-lane high-speed expressway all connected with complex 8-way exit ramps to local streets. And there’s two mass transit lines and some dangerous right turn accesses too. And .. some afterthought bike lanes through the middle of this. It is one thing to “street calm” Cesar Chavez, it is quite another to address this massive Caltrains interchange monstrosity. Turning this into a “regular street” is going to require demolition balls, not paint and landscaping. Fixing this for real will be a huge job. Great video. Wow, imagine the day when we can get that sort of infrastructure for cyclists in SF …. Notice how, starting at about 3:08, the cars yield at the intersections to the cyclists. Just wow. You know in SF they would pull out in front of you. But that is exactly what they need to do on San Jose: put a curb with 3 feet of greenery in between cars and cyclists. I always tell people to just think of the cycle track as a second sidewalk. In the US, we think of bike lanes as a second road, but it should be the first way. Once you make that mental leap, then proper cycling infrastructure comes naturally. Absolutely (and glad you enjoyed the vid). We’re still reeling from the effects of vehicular-cycling planning–to the extent bikes were even planned for at all–but that’s the best way to put it. A cycletrack is basically a second sidewalk. And actually in many cases should be raised just like a sidewalk as it helps with visibility. Having lived in the Netherlands I was fortunate enough to experience this stuff every day and now that I’m back in SF I realize the issue is a lot of citizens just don’t know what they’re missing but with the experience of this kind of infra would immediately fall in love with it once they realized it was a possibility. There’s absolutely no (good) reason why this couldn’t exist here. I really hope that report does something to change Caltrans. Modest changes like this one should be a no-brainer, and they could be doing a whole lot more. If you read the piece above and one of the articles linked to from a few years ago: http://sf.streetsblog.org/2010/08/25/the-long-and-winding-road-to-traffic-calming-the-bernal-cut/ it sounds like the citizens have been doing their part just fine, at least in this case. It’s the city and state agencies that weren’t acting. Does anyone know why the protected bike lane was added in 2005 to the southbound side only? It never made sense to me that only one side had the road diet implemented, given that both are basically the same width. Yet the plans it keeps on coming up with consistently fall breathtakingly short of attaining any even single one those things. These self-defined metrics are what SF’s bike improvements should be judged by, not comparisons to the situations of most other American cities, which is in most cases setting the bar extra low. Since best practices for attaining these goals through policy and infrastructure are well known and established, it makes even less sense for SF to continue aiming low with years of reviews and lots of money being used to implement at-best archaic and lukewarm and at-worst often just plain dangerous infrastructure. #Hyperdemocracy and #sloganfirstcity, SF in a nutshell. It was a matter of having the space to create the bike lane. There was enough space on southbound San Jose Ave to create the lane in 2005. Supervisor Wiener’s office has been pushing to reduce car lanes northbound in order to accommodate a bike lane. 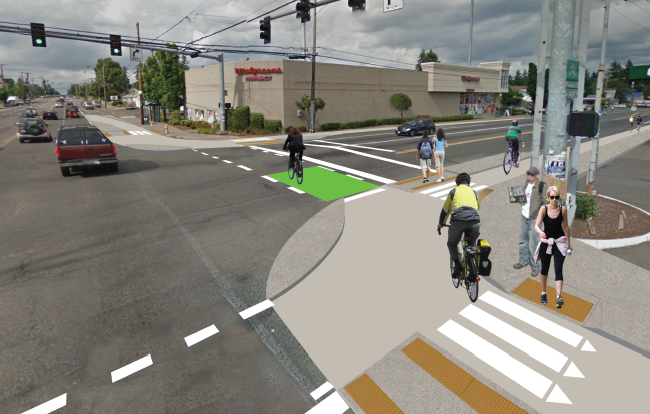 For example, it would seem even the retrofitted Walgreens intersection I linked above could be more or less accomplished via a demo since this kind of cycletrack is really just an add-on to the existing sidewalk inside the radius cars should be driving around anyway. Some temporary barrier could play the role of the teardrop-shaped protective island. Though I wonder if/doubt that the city would allow such supposedly “radical” “tests” (despite their decades of success in the Netherlands) to occur on a live street–if not perhaps it’d need to be done during an Open Streets event or on some closed street somewhere or even reconstructed on some open paved lot (à la the Berkshire roundabout) or something. I’d love to help out and get involved in any way I could. I just wonder what the best channels are to do this through. And yes, that guerrilla DIY example in Seattle is one of my favorites!